A true turbine rc model jet engine adds the ultimate touch of realism to a radio controlled jet, and commercially produced units for rc use are now widely available - if not always affordable! Turbine rc jet flying has become a big thing in recent years and there are some spectacular models around, large and small, but this aspect of the hobby is not for the novice. Endless hours of flying experience and an impressive budget are needed to actively participate in flying proper radio control jets powered by real gas turbines. Even the smaller model jet engines are not cheap - and that's on top of the cost of the jet itself, the radio gear and all the other necessary accessories. So it's serious business indeed but ultimately has to be one of the most rewarding ways of enjoying rc flying... if you can afford it! Incidentally, rc model gas turbine engines are also used in other rc aircraft types such as turboprops and helicopters but, from a personal point of view, I don't find scale turbine powered helis too realistic because of the sound - rc helicopters running on a turbine sound more like jets than helicopters (again, just a personal opinion). 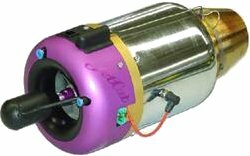 Shown right is a JetCat model turbine, one of the first and more popular commercially produced model jet engines readily available. Wren, from the UK, is another favourite model jet engine manufacturer with an excellent reputation. Before real model jet engines appeared on the radio control flying scene, rc jets always lacked the authenticity of having a true gas turbine. Previously radio control jets had to be powered by either an engine with a propeller (thus spoiling the look of the aircraft) or ducted fan units. A ducted fan unit, like the one shown on the right, is mounted inside the jet's fuselage. This at least means there is no propeller to ruin the look of the jet, but until electric ducted fans (EDFs) became widely available the only choice was an IC (internal combustion) powered one, notably powered by a glow plug engine. An IC ducted fan unit is very noisy and this unrealistic sound, like the presence of a propeller, really ruins the realism of a model jet. More recently the EP (electric powered) fan units have become commonplace and while the noise isn't particularly realistic*, it is better than an IC fan unit. EDFs have made flying a model rc jet much more accessible within the hobby. *With that said about the noise, newer EDFs with a higher blade count (say 12) make a closer sound to a turbine, and so do sound more realistic. Pulse jets were another option but these are more rocket motors than anything else. A pulse jet runs at full throttle for a short time and then the jet glides. Fun maybe, but not particularly realistic! But now, thankfully, model jets can be powered by a fully functional and realistic looking and sounding jet turbine, thanks to manufacturers like JetCat and Wren. A model jet engine design can vary slightly from one manufacturer to another but they all work on the same basic principle. The most common type nowadays is the centrifugal flow turbine as opposed to the lengthier axial flow turbine. The big difference between centrifugal and axial flow turbines is in the stage of air compression. In a centrifugal flow unit, air entering the turbine is thrown outwards as it passes over the spinning impeller, or compressor. The air hits against the inside of the can at great speed and so gets highly compressed as it passes into the combustion chamber. This intense compression increases the pressure and hence temperature of the air, making it more effective when it mixes with the fuel. The kerosene based fuel, commonly called Jet A1, is introduced into the combustion chamber as a very fine mist and so mixes easily with the now highly compressed air. This fuel/air mixture is then ignited by a small glow plug, much the same as the one found on a 2 or 4-stroke model airplane engine. As the fuel/air mixture ignites and explodes within the chamber, the coned shape of the chamber and the incoming flow of new air forces the mixture rearwards towards the turbine. The rapid outward flow of the fuel/air mixture spins the turbine which in turn spins the compressor at the front of the jet engine (the turbine and compressor are connected by a central shaft), and so repeating the cycle. The gases (exhaust) finally get squeezed through the narrowing jet pipe at the very rear of the engine, exiting at great speed and pressure thus generating the high levels of thrust associated with jet turbines. Model jet engines need to be started with compressed air to initially power-up the turbine. This can be supplied from a diver's oxygen tank or a similar source. Only when the compressor has reached the necessary revolutions per minute (RPM) can the fuel be introduced into the chamber and the engine operate normally. Gas Turbine Engines for Model Aircraft (shown right) by Kurt Schreckling and Keith Thomas. "I found the book easy to follow and I've found that Kurt Schreckling and Keith Thomas have made an excellent job of bringing the complexities of the gas turbine to a level the average person can understand and learn from..." (Amazon customer review). Model Jet Engines (shown right) by Thomas Kamps and Keith Thomas. "Until I saw this book I didn't believe it would be possible for an amateur to build a jet engine, capable of running at 100,000 rpm . Kamps book explains clearly how, with a reasonably well equipped workshop, a model engineer can build an efficient working jet engine..." (Amazon customer review).